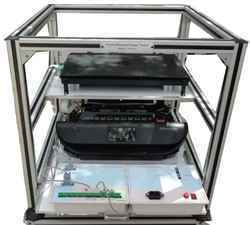 -Aesthetically designed injection moulded electronic desk (Master unit) carrying useful experiment resources. while the central slot will carry DVD mechanism secured in an ABS molded plastic sturdy enclosure. 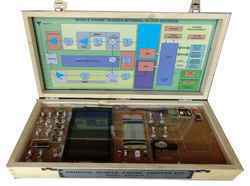 - DVD Trainer kit provided with the trainer is the latest one which based on modern Technologies with remote control and not on any outdated ICs. - Main DVD kit Mounted in all open fashion in master unit for easy viewing through transparent acrylic cover provided. - Facility to connect LCD / LED / CRT TV. - 2 Nos. of Good Quality Sound Speakers are provided. - IR Sensors / Keyboard / USB Port are provided on Front Panel. - Useful for Post Graduate projects and research purpose. Student Workbook and Instructors Guide supplied. -Fault panel provides opportunity for student to tackle some commonly arising faults given on fault panel. Various components of the printer are made accessible to the students by spreading out on a cuboid demo rack made from aluminum profiles. Non-destructive simulated faults have been implemented through slider switches located on Fault Panel to teach section wise faults & their troubleshooting. 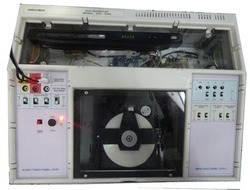 When not in use Printer trainer may be used as a USB port based regular Lab printer / scanner machine. Set of Instructor Guide and Student workbook provided with each unit . • XPO-LAN offers comprehensive experiment set up explaining various physical topologies of LAN viz; Token Ring, Token Bus, Ethernet (CSMA/CD), Modbus etc. & variety of TCP, IP, HTTP, SMTP,Wieless LAN (802.11) etc. Protocol demonstrator through error generation facility sans socket programming. • Set of Users Guide provided with each unit. 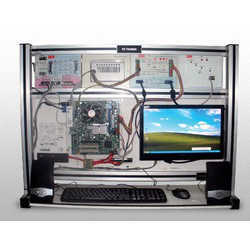 • Table top setup made using light but sturdy Aluminum profile (4X2) Rack complete with cables, connectors, Optionally external USB to RS232 converter is Provided One PC with serial required for monitoring or as user but not in scope of supply. • Useful for Post Graduate projects and research purpose. Experiments : - To study general block diagram of a mobile phone. - To study Mobile transmission section. - To study mobile reception section. - To study different nos. of faults provided with the trainer. - To study & observe voltages/waveforms of each test points. - To study mobile charging circuits. - To use Mobile phone as modem for using AT commands as given; a) Sending text messages, read/delete massages etc. b) Calling to a no, reject/accept the incoming calls etc. c) GPRS related commands. Study of Bluetooth technology & connection with other BT devices. Bluetooth profiles : BIP, BPP, DUNP, FTP, HID, OPP , SAP, A2DP, PBAP, SPP etc. To study general idea of SIM card. (Local SIM card must be inserted by the user at the time of experiment). 2) LED/HD TV kit Mounted in all open fashion on a PVC board, firmly supported on compact table top alluminium profilet demo rack for easy viewing through transparent acrylic cover provided. 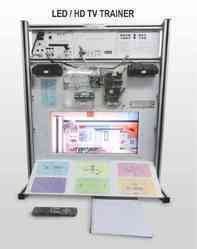 3) The Complete functional Block diagram is displayed on single platform on the stand as shown in diagram. 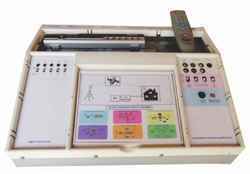 4) Trainer consists of 9 function blocks giving a good idea about different important section of receiver and a fault panel. 5) Facility to connect VCD, DVD and Video games. 6) 2 Nos. of good sound quality speaker are provided at sides of Trainer. Aesthetically designed injection molded electronic desk (master unit) carrying useful experiment resources.Non destructive faults have been implemented through slider switches mounted on panel to teach section wise faults and their troubleshooting.Main DTH kit mounted in all open fashion in master unit for easy viewing through transparent acrylic cover provided.Useful for post graduate projects and research purpose.Facility to connect LCD, LED, CRT TV.Set of instructors guide and students workbook provided.